"Sheet-pan dinners" are all the rage recently, and for good reason—protein and vegetables cook together on one pan for super easy preparation and clean-up. This recipe uses a variety of roasted vegetables and chicken or turkey sausage for a healthy, delicious dinner that's full of different textures and flavors. Tossing everything in spices and olive oil gives you crisp-tender, well-seasoned veggies. Make this dish on Sunday and enjoy leftovers throughout the week. Serve the vegetables and sausage alongside quinoa or rice, or with an over-easy fried egg on top! Here’s a great way to practice saving time in your everyday routine by allowing your oven to do all the work! Throw it all together in one pan and let your oven do the cooking for you. Feel free to experiment with seasonal vegetables to substitute what’s in this recipe. Per Serving: 656 calories; 44g fat; 39.4g carbohydrates; 25g protein; 86mg cholesterol; 775mg sodium. 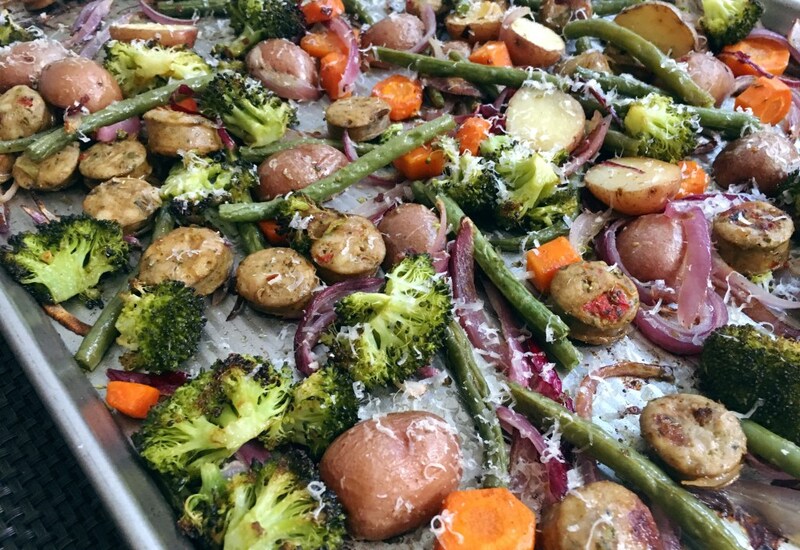 Love these pan roasted vegetables! Perfect for my weekly meal prep. I'm also thinking of making this for the holidays. Red potatoes are my absolutely favorite! I'm obsessed with sheet pan meals! This was so delicious and well put together. It's a complete, well rounded meal that's seasoned to perfection. Definitely makes the list of my favorite one-pan recipes. This was a really good recipe. I added extra sausage, but other than that didn't alter the recipe at all. This is great my meal prepping also. Sounds good. How about doing this in my MultiPot?